Bam! Kapow! Take that, dirt! Patients at UCLA Mattel Children's Hospital gazed skywards, their eyes riveted on five window washers dressed as superheroes. Batman, Captain America, Spider-Man, Wonder Woman and the Hulk waved merrily before polishing a few windows and descending from the roof. 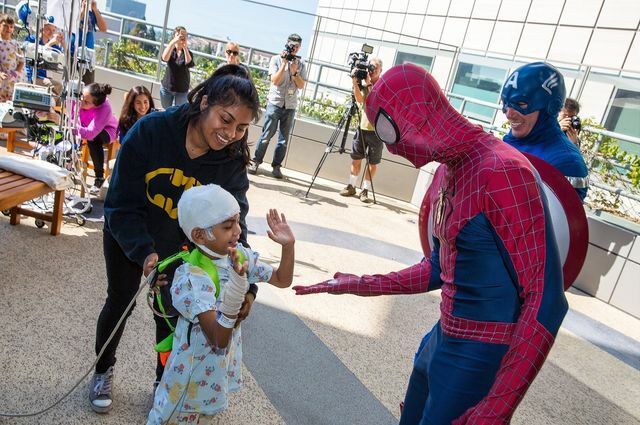 Greeting patients with fist-bumps and Spidey sense, the grime fighters posed for photos and brought a super amount of cheer to young patients waiting on the hospital terrace at the fourth annual Superhero Day at UCLA. 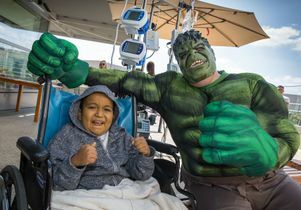 “They were coming around and giving high-fives, and we took pictures,” exulted Aidan Troung, 6, who was thrilled to see his favorite superheroes up close. Rick Kincer, owner of the hospital’s window-washing vendor, Sunland Window Cleaning, created the event in 2013. The firm once again provided the colorful costumes and donated its staff’s time to entertain the kids. The visit brought smiles to the faces of even the most solemn pediatric patients. Many are coping with serious illnesses like cancer and organ transplants that require them to remain hospitalized for months at a time. "Events like this give the children a chance to forget they’re in a hospital and just feel like a kid again,” she said. A patient gives Spider-Man a high-five.